The rail industry is experiencing mixed fortunes globally. Mainline passenger traffic has grown rapidly in Asia and South & Central America, but fallen significantly in the Former Soviet Union, Eastern Europe, Africa and the Middle East, according to a report by German transportation consultants SCI Verkehr in 2017. Railway operators are adopting digital technologies rapidly as they fight to attract passengers from lowcost airlines & private cars and compete with the increasingly automated road freight sector. Operators are taking to smart digital platforms to improve passenger communications and sales. Old infrastructure is being replaced by Train Control and Management System empowered by the IIoT and “Big Data” analytics. Sensors installed in trains and along tracks enable monitoring, data collection and analysis to take place in real-time as well as supporting remote diagnostics and predictive maintenance. The information collected should allow equipment, tracks and stations to operate more efficiently as well as improving safety and reducing costs. Rail freight faces a downward trend due to the decline of heavy freight such as coal & steel and reduced growth in international trade. Rail freight operators are pursuing maximum efficiency and productivity by expanding their take up of the sophisticated internet of things (IoT) technology and IT systems already commonplace in the road freight industry. Operators of passenger and freight services on rail networks worldwide seek to promote the highest levels of safety and reliability. The development of a growing range of international standards in the railway sector is driven by technical developments in modern transportation and a movement towards computer based management, control and communication systems. Many IEC technical Committees (TCs) and subcommittees (SCs) collaborate on drawing up International Standards that cover the systems and components used in railway networks, metropolitan transport networks (including metros, tramways, trolleybuses and fully automated transport systems) and magnetically levitated transport systems. IEC TC 9: Electrical equipment and systems for railways, prepares International Standards for the railway sector, which includes rolling stock, fixed installations, management systems (including communication, signalling and processing systems) for railway operation, their interfaces and their ecological environment. These standards deal with the electromechanical and electronic aspects of power components as well as with electronic hardware and software components. The safety aspects of TC 9 encompass passenger safety, including alarm systems and communication between the operator and passengers; electrical safety; protection against fire; safety hazards in long tunnels; event recorders such as “black boxes” and automatic system surveillance and IT security for railways. TC 9 is also involved in standardization projects to promote energy management for increasing energy efficiency in trains and associated infrastructure, particularly in the areas of energy saving. These include the use of TCMS to help optimize driving behaviour and manage energy; onboard energy measurement systems to support energy calculation and the saving and recovery of braking energy – for example in the shape of reversible electrical substations, hybrid traction and onboard or stationary energy storage. IEC TC 56: Dependability, deals with the reliability of electronic components and equipment in rolling stock, and TC 100: Audio, video and multimedia systems and equipment, prepares standards for on board multimedia applications. Other IEC TCs and SCs that cover the vast range of components and systems used in railway operations include TC 20: Electric cables; TC 22: Power electronic systems and equipment; TC 32: Fuses; SC 48B: Connectors; TC 79: Alarm and electronic security systems; and TC 106: Methods for the assessment of electric, magnetic and electromagnetic fields associated with human exposure. The IEC cooperates with other international organizations to promote standardization and avoid duplication. A cooperation agreement between the IEC and ISO/TC 269: Railway applications, ensures coordination in the development of international standards related to railway applications between electrical and nonelectrical activities. The IEC and the International Union of Railways (UIC), the worldwide railway organization, liaise on standards to increase the safety, efficiency and cost effectiveness of rail systems. The coordination between the IEC and the International Association of Public Transport (UITP) focuses on the development of international standards for urban transport. 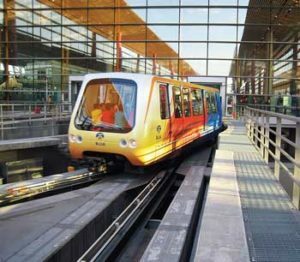 Although some driverless metro train services currently operate around the world, these are automatic rather than autonomous. The next decade is likely to see the rail industry adopt autonomous vehicle technology more widely. This scenario envisages trains making decisions by themselves using sensors, 3D maps and real time data. Previous: NEW METROPOLITAN DIMENSION: Smart or Intelligent?